Joseph Jaffe – well-known since his book Flip the Funnel came out – was one of the keynote speakers at this year’s edition of B2B Marketing Forum. Of course he shared his insights on the ‘flipped funnel’, but also on real customer centricity, customers that show their brand love via tattoos, Jaffe’s personal definition of a successful book and lots more. Q1: The ‘Flip the Funnel’ concept already dates back to 2010. Still so many B2B companies and professionals struggle with this concept which places attention to existing customers and ambassadors over the hunt for new leads and prospects. How come this concept is so difficult to turn into tangible action for so many? Deze video zie je nog niet omdat er (nog) niet akkoord is gegaan met het plaatsen van cookies. Q2: In your keynote you compared some marketeers with pimps. To this analogy these are marketeers that chase superficial, quick contacts with prospects in order to drive new business. By doing so they place their own interests over and above the customer’s interests. What shows many B2B companies put themselves and not so much their customers at the core of everything they do? Q3: You wrote several books including Join the Conversation, Flip the Funnel and more recently Z.E.R.O., Zero Paid Media as the New Marketing Model. What makes a book successful from a personal perspective? 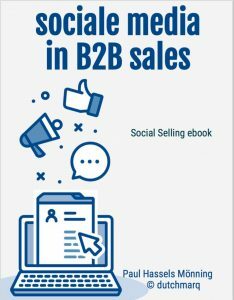 Tips ontvangen in B2B marketing & sales? DutchmarQ enables B2B companies to (international) growth in the digital age. Founded by digital strategist, author and trainer Paul Hassels Mönning MSc. DutchmarQ provides program management and training with measurable impact in leads & sales. Boosted by a network of hand-picked, specialist professionals, companies & smart tools. What B2B question is on your mind today? Subscribe to B2B marketing & sales tips!